Since I haven't mentioned what's trending in quite a while, I've decided to put a spin on my usual post and give you the latest deets on what fashion trends I'm crushing on at the moment! 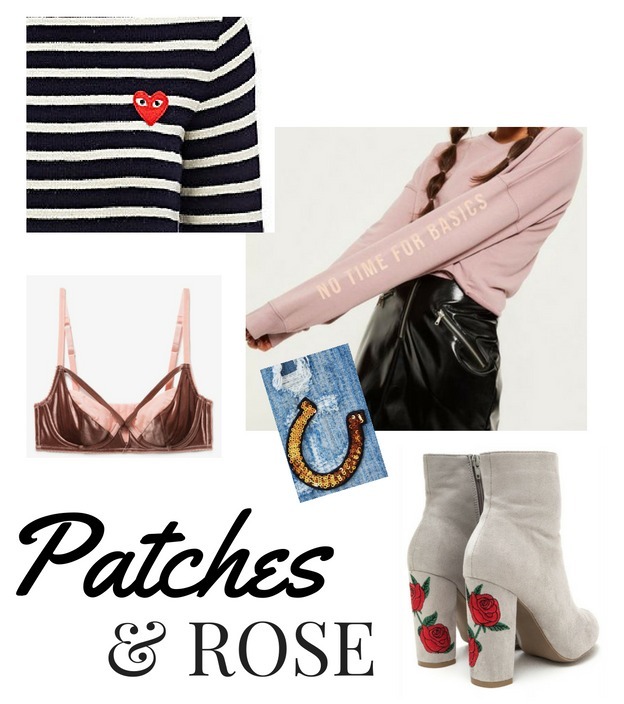 If there's one thing I'm loving in fashion right now it's the nod to the 90's with patches. Using patches is so rebellious- you decide which patches you want to collect and iron onto your clothing. What a way to make a statement! Many designers have taken the frustration out of the equation, allowing you to buy jackets and shoes with the patches already added. My favorite are the rose patched booties above--serious in the front and a real party in the back! I'm also loving all of the dusty rose colors on sweaters, bralettes, you name it! The color is very romantic, especially if mixed with a velvet texture. If you like more of the athliesure look, PINK is brimming with rose colored sweats and leggings at the moment, and they are having their Semi-Annual Sale right now! I think this color looks amazing with all skin tones, making it an necessity in your winter wardrobe.